The new DDGetSID CLI tool is a command-line interface app developed to help you diagnose Windows client Active Directory login. Prints the SID for current user. 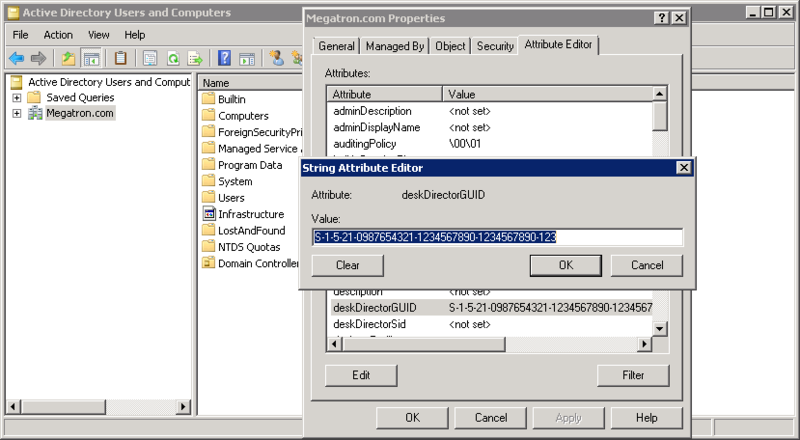 This SID can be used to setup the Domain SID for a company, read the article here. Prints Active Directory user information. Prints Active Directory diagnosis information. Use this command to print out custom SIDs and the original SID. Generates a random SID and set it to registry. In some rare cases, you may have multiple companies using the same domain SID. This means contacts could be created under the wrong companies. DD Portal for windows supports custom domain SID's from version 1.84.0. The custom domain SID can be setup in two ways: Windows Registry or custom Active Directory attribute. All PC's in the company will need to be setup with this registry key. 2. Set the value to a unique SID. You can generate a random SID with the DDGetSid-CLI tool. 1. Create a Unicode string attribute named deskDirectorSID or deskDirectorGUID in Active Directory Schema. 2. Associate the attribute to the domain class in the property dialogue. 3. Restart the Active Directory Domain Services. 4. Generate a SID and set it to the custom attribute. 5. Verify the custom domain SID is being used in the CLI tool.